NASA launched its final space shuttle mission this morning, and commanding the crew is Chris Ferguson, a former member of the PAL Cadets Drum and Bugle Corps of Philadelphia. Ferguson, who is a retired U.S. Navy captain, has flown on two previous shuttle missions. 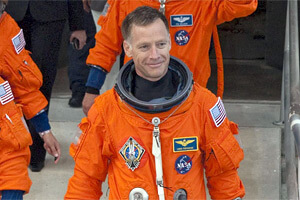 He served as pilot of STS-115 in 2006 and commander of STS-126 in 2008. He's logged more than 28 days in space. The current mission, STS-135, is the 135th mission of NASA's shuttle program. Eventually docking with the International Space Station, Ferguson and his crew of three other astronauts have a number of objectives to complete during their 12-day mission. Ferguson told Drum Corps International Magazine in 2007 that his time in the drum corps activity very well may have set the stage for his future career as an astronaut. Describing his experience as a percussionist with the PAL Cadets he said, "There were military overtones that I would see a lot more of in my future … I learned not to be afraid to try something new. Jump in, and see how it works out." Read the article featuring Ferguson below.